There are a number of opportunities in our area to learn about the wonders of our natural resources by becoming a Minnesota Master Naturalist. Who can become a Minnesota Master Naturalist volunteer? Any adult who is curious and enjoys learning about the natural world, shares that knowledge with others, and supports conservation. If you enjoy hiking, bird watching, following tracks, or identifying wildflowers, you’ll love being a Minnesota Master Naturalist Volunteer. MN Phenology Network 9th Annual Conference – Oct. 12, 13, and 14, 2018 at the Cedar Creek ESR. Scholarships Available. If the fee is a hardship, fill out the scholarship application and send it to Minnesota Master Naturalist. For more information call the MMN office at 888-241-4532. 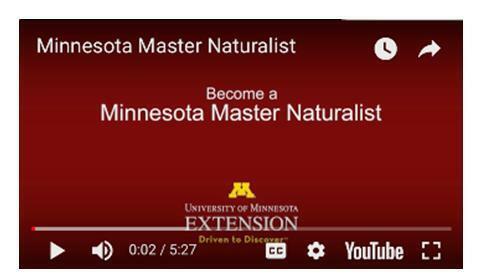 Why be a Minnesota Master Naturalist. If you enjoy hiking, bird watching, following tracks, or identifying wildflowers, you’ll love being a Minnesota Master Naturalist Volunteer. Minnesota Master Naturalist Volunteers are a motivated group of fun and interesting people: teachers, retired professionals, nature guides, hunters, eco-tour operators, farmers, and…YOU! Stewardship Projects—these projects would involve natural resource management activities such as invasive species removal or restoration projects. Education/Interpretive Projects—these projects would be public presentations of natural resource information, educational materials development, or leading hikes. Citizen Science Projects—these projects would focus on volunteers gathering data and returning it to researchers to support the research projects. Examples would include: Monarch larval monitoring, plant or animal counts, or water quality monitoring. Program Support—these projects include working in a store or office of the Minnesota Master Naturalist or sponsor, or serving as a local chapter organizer.